Brand new from Dalbello, the Lupo AX 110W is a high-performance, versatile boot for advanced to expert skiers looking to ski hard in both the resort and the backcountry. Utilising Dalbello’s unique 3-piece design, the tongue of the boot acts as a leaf spring offering a natural, progressive flex and helps eliminate shin bang. Packed with features to get you in to the backcountry, including tech inserts, a walk mode, and walk-to-ride soles. Bootfitter’s comments: The very popular Lupo AX is geared towards advanced skiers looking for a high-performance boot to do everything. Medium-volume 100mm fit offers a great blend of precision and comfort. The Kyra 95 is targeted toward high performance female skiers seeking the absolute best blend of versatility, performance and fit for unlimited access to every aspect of the mountain experience. The Kyra 95 design incorporates many of the structural and performance features of the popular Krypton construction and adds a sturdy and precise Ski/Hike cuff lock for uncompromising performance and freedom to roam. Dalbello’s 3 Piece Cabrio design provides responsive and consistent flex with superior lateral and rearward support. 102 mm Contour 4 Fit Technology allows for a close anatomic fit while accommodating the typical hot-spots many skiers encounter. All Kyra models incorporate Dalbello’s popular women’s specific expandable cuff which provides up to 5 cm of adjustability to accommodate any calf. Modern, Center Balanced “Rocker” Stance allows skiers to take full advantage of their equipment by centering body mass over the sweet spot of their skis for more power and control with less effort. Available with TRUFIT Comp fit system innerboots or optional ID Thermo "NOW" Custom Fit liners for lightweight comfort, warmth and shock absorption. Bootfitter’s comments: A ladies’ version of the best-selling Panterra, the Kyra is an all-mountain boot designed for advanced skiers. The ID heat mouldable liner gives great precision and warmth, while the ski/hike mode allows you to explore beyond the resort in comfort. Bootfitter’s comments: A broad-fitting, all-mountain boot for the advancing skier, the Kyra’s comfort and adjustability make it a hugely popular boot. The women’s-specific K2 Minaret 100 ski boots are back and leading the charge for the expert ladies who demand confident downhill performance, but value the range of motion attained through a comfortable walk mode. It comes tour-ready with integrated tech fittings, making it easy to stay in the same ski boots from an early morning skin on the pass to lapping groomer runs at the resort. Bootfitter’s comment: A ladies’ version of the hugely popular Pinnacle series, the Minaret features a custom liner, walk mode and tech inserts in the soles, adding up to a hugely versatile boot, whether touring or skiing the resort. K2 proudly introduces the B.F.C. 90 – a resort boot Built For Comfort that won’t kill your powder party. This 90-flex B.F.C. was designed for women interested in a boot they don’t have to think about all day on the hill, and that will transition quickly into walk (dance) mode. The K2 Powerfuse Spyne paired with our freshly engineered après experience packs both. New for 2017/2018, the BFC 90W is also offered with a heated liner for even more comfort! Bootfitter’s comments: K2’s widest-fitting boot is geared toward the intermediate skier seeking convenience, ease of use, and of course comfort. The shell design allows this boot to be put on hands-free (we have tested this, it works! ), and the walk mode helps take the pain out of trekking around the resort. The heated liner option is the ultimate luxury upgrade! Any mountain, any snow and any challenge is what the all new women's Cochise 105 was designed to conquer. Comfort and warmth is solved with a new progressive 99mm women's specific last with C.A.S. and Merino Wool. A new Power Light Design Frame makes this light weight, 4 buckle, high performance boot ready to charge down anything you want to bring it to the top of. The Cochise 105W delivers a world class touring option with built in Dynafit tech inserts and our new S.A.S. Cuff Mobility System. The new benchmark for women's specific Freeride boots, the 105 is designed to let you ski anywhere, anytime. Conquer your mountain! 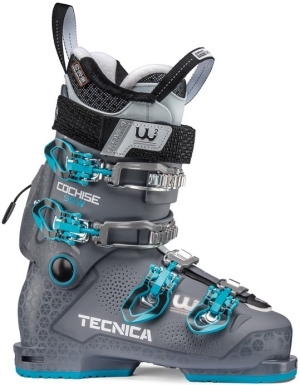 Bootfitter’s comments: Tecnica have refined the bestselling Cochise 105W to offer even greater performance and fit flexibility. A 99mm shell offers full customisation for a personalised fit, while retaining all the touring functionality and downhill performance that makes these boots so popular. The Cochise 95W brags many of the same key features as the women's 105, including the new S.A.S. Cuff Mobility System, and at a 95 flex it's perfect for the advanced female skier looking for performance, fit and function. Tecnica's Cochise shells are redesigned with a new technology called Power Light Design which allows us to make very light boots that will perform beyond your expectations. A women's specific C.A.S. liner with Merino Wool that is scalloped and lowered for women's specific anatomy combined with Quick Instep ensures comfort and ease of use. The Cochise 95W can get you to those new heights, realize your ski ambitions and conquer your mountain. Bootfitter’s comments: A great crossover boot for those looking to get in to backcountry skiing, the Cochise 95 offers lightweight touring functionality, while still maintaining a focus on downhill performance.